This authoritative resource illustrates and discusses the pathologic, radiographic, and differential diagnostic aspects and clinicopathological correlations for a full range of neoplastic and non-neoplastic conditions of the bones and joints. A bulleted, outline format makes reference quick and easy, and a bonus CD-ROM—new to this edition—offers all of the book’s illustrations in electronic format. Uses more than 950 full-color illustrations, along with concise descriptions, to capture the radiographic, microscopic, and macroscopic features of all types of tumors and tumor-like conditions of the bones and joints. Offers concise summaries of diagnostic and differential diagnostic criteria • pathological features • radiologic features • special stains and immunohistochemical techniques • biological behavior and follow-up • and treatment and prognosis for each lesion. Presents information in a bulleted outline format for fast and user-friendly reference. "To turn the pages of this largely pictorial tome, is to wonder at the brilliance of the photomicrographic reproduction (many reminiscent of the designs on William Morris wallpaper), the clarity of the radiographs and the breadth of permutations of tumour-like disease. It is clear the that the work comes from a Centre of Excellence." "An exceptionally well presented concise guide. 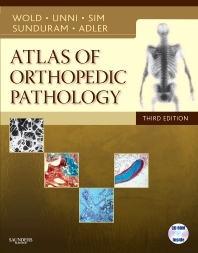 The book consists of wide range of clinical, radiological and pathologic descriptions accompanied by radiographs, photographs of gross appearances and histological pictures of various orthopaedic pathological conditions"